Travelling North towards Poitiers on the N10, take the D113 towards Tourriers, Villejoubet, St Amant de Bxe and St Angeau, at top of slip road follow D915 St Angeau 13 Kms, keep on this road (ignore SatNav) till you get to junction with D15, turn right direction St Angeau 9, keep on this road for 8 Kms, on right you will see the tourist sign for Camping Devezeau, turn right and we are on the right hand side about 1/2 km. 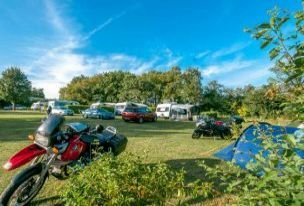 Pitch fee tariff is per day and is payable from 12:00 on day of arrival to 12:00 on day of departure. WiFi is available throught most of the site and is a free service. Service is subject to availablity and performance is not guaranteed. Electricity and Water is included in pitch fee where available. All Standard and Large Pitches have dedicated 6 Amp Electric Hook-ups. All Large Pitches have dedicated water and waste. All Freestyle pitches have access to water and, where available, electricity. Taxe Sejour is currently under review and may increase. Arrival or departure outside of these times is possible but a supplement pitch fee may still be applicable particularly in high season. We do not accept category 1 or 2 dangerous dogs. We are able to accept Cash, Credit or Debit Cards on site. Deposit payments can be made by Bank Cards, we will call you back to a landline for your card details. If you wish to pay by Bank Transfer, details will be sent to you on request. All bookings will be confirmed upon receipt of cleared funds. 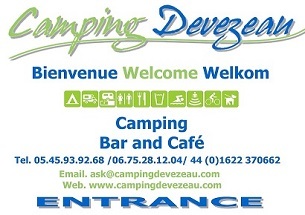 Camping Devezeau is now OPEN until 30 September 2019.